UN Secretary-General Antonio Guterres warns Trump's recognition of Jerusalem as Israel's capital could harm his own peace efforts. U.S. President Donald Trump's decision to recognize Jerusalem as Israel's capital might hinder his efforts for an Israeli-Palestinian Authority (PA) peace accord, UN Secretary-General Antonio Guterres warned on Sunday, according to AFP. Speaking on CNN, Guterres said he was pleased that Trump's son-in-law and adviser Jared Kushner had been meeting with Israelis and Palestinians on a new peace plan after years of stalemate in the process. 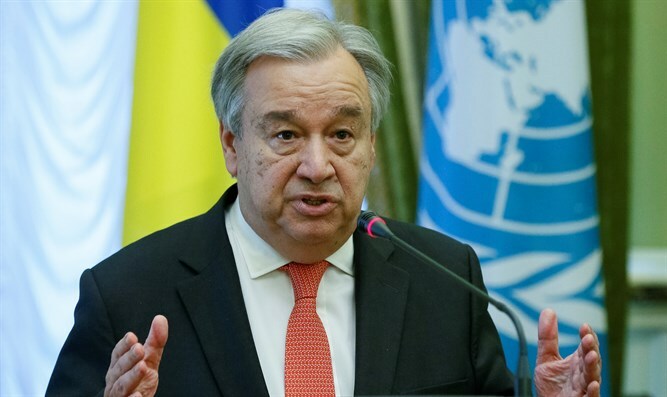 "I am not saying that it will happen, but there was a hope that it would be possible to finally bring this horrible conflict between Israel and the Palestinians to an end," Guterres said. "I think that the decision that was taken on Wednesday risks to compromise this effort," he added. Following Trump’s announcement, the UN chief stressed that there is no alternative to the two-state solution for Israel-PA peace, and that Jerusalem is an issue that must be resolved through direct negotiations between the parties. “In this moment of great anxiety, I want to make it clear: there is no alternative to the two-state solution. There is no Plan B,” he said at the time, adding, “For my part as the UN Secretary-General, I will do everything in my power to support the Israeli and Palestinian leaders to return to meaningful negotiations and to realize this vision of a lasting peace for both people." The PA lodged a complaint with the UN following Trump’s decision, urging the Security Council to declare Trump's decision to be against international law and to work toward reversing it. Meanwhile on Sunday, U.S. Ambassador to the UN Nikki Haley said that fears of unrest over the Trump decision are overblown. Haley, who also was interviewed by CNN, was quoted as having that Trump was the first U.S. president to have the "courage" to make a move that she said many Americans and others around the world supported. "When it comes to those people (who are) upset, we knew that was going to happen. But courage causes that... I strongly believe this is going to move the ball forward for the peace process," she added, suggesting the move would simplify negotiations. "Now they get to come together to decide what the borders look like, they get to decide the boundaries and they get to talk about how they want to see Jerusalem, going forward. All we did was say, 'this is not something we're going to allow to happen in the middle of your negotiations," she said. Haley made similar comments in a separate interview on Fox News. In that interview, she also criticized the United Nations for its “Israel-bashing sessions”, adding that the anti-Israel bias hurt, rather than helped, the peace process. "Ever since I got to the United Nations, there have been repeated attempts to hit Israel for no reason whatsoever - Israel-bashing sessions, constantly trying to find ways to pick at them. And we've seen that start to diminish. But I want the Security Council and the rest of the international community to understand: When you bully Israel, you are not helping the peace process. And we see Israel as one of our best allies. We're not going to put up with it anymore. So when we see it, we call them out on it."